This library serves the city of San Diego. For the library serving the county, see San Diego County Library. A notable librarian during this period was Clara Estelle Breed (1906–1994), who served as children's librarian at the downtown branch and was appointed City Librarian in 1945, a post she held for 25 years. She founded numerous branch libraries and established the Serra Cooperative Library System, which allows users to borrow books from other libraries in San Diego and Imperial counties. She maintained contact with many Japanese American children when they were interned with their families during World War II; her correspondence with those children is now on display at the Japanese American National Museum in Los Angeles. Over the years, many branch libraries have also been opened throughout the City. In 1952, the Carnegie Library was demolished and a new Central Library was opened at the same location on June 27, 1954. That library closed permanently on June 9, 2013, to begin the 10-week process of transferring its 2.6-million-item collection to the new library. 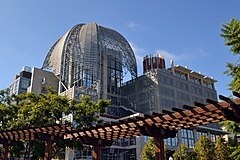 In 2010, construction began on a new $184.9 million 366,673 square feet (34,065.0 m2) Central Library at 330 Park Boulevard in downtown San Diego. This 9-story structure was designed by San Diego architect Rob Quigley. It opened on September 30, 2013. The library displays numerous books and collections, including the second largest collection of baseball memorabilia in the U.S. The Central Library also houses a new charter high school, e3 Civic High School, which is billed as the only school in the United States to be housed within a library. The school serves grades 9 through 12. It opened on September 3, 2013 with an initial student body of 260 ninth and tenth graders. Additional grades were added in 2014 and 2015 resulting in a student body of approximately 500. The San Diego Public Library system currently consists of the Central Library, 35 branch libraries, and an adult literacy program office (READ/San Diego). Library cards are free to applicants who reside within the state of California or own property in the city of San Diego, and to men and women serving in the armed forces who are stationed within San Diego County. Library cards are permanent and must be renewed every two years. There is a $30 annual fee for a non-resident library card. In fiscal year 2006, the Library system had a circulation of more than 7 million and more than 6 million visits by patrons. The San Diego Public Library was one of the first major library systems in the United States to offer free wireless Internet access at all of its locations, including the Central Library and branch libraries. While testing the Spirit of St. Louis airplane in San Diego, Charles Lindbergh used the resources at the San Diego Public Library to plot the course for his historic solo flight across the Atlantic Ocean. Renowned American sculptor Donal Hord bequeathed to the San Diego Public Library his lifelong collection of books and several sculptures in appreciation for the assistance he had received from library's staff over the years. ^ Smythe, William E. "Part Six, Chapter V: The Public Library". History of San Diego, 1542–1908. reproduced at San Diego History Center. Archived from the original on December 29, 2012. Retrieved February 6, 2013. ^ "Clara Estelle Breed (1906–1994)". San Diego History Center. Archived from the original on August 5, 2012. Retrieved February 6, 2013. ^ a b Moran, Greg (June 10, 2013). "Downtown library checks out". San Diego Union Tribune. Retrieved July 3, 2013. ^ Showley, Roger (January 19, 2013). "No flubs at library building site after 899 days". San Diego Union Tribune. Retrieved February 6, 2013. ^ "San Diego's main library closes, clearing way for new one". CBS 8. June 9, 2013. Retrieved October 6, 2013. ^ Magee, Maureen (September 3, 2013). "Central-library charter school opens". San Diego Union Tribune. Retrieved October 6, 2013. ^ Crawford, Richard (April 26, 2008). "Ryan Airlines gave Lindbergh wings". San Diego Union Tribune. Retrieved March 7, 2016. ^ "Donal Hord self-guided outdoor tour". San Diego History Center. Archived from the original on March 7, 2016. Retrieved March 7, 2016.